While Big Hero 6 is not a part of the Marvel Cinematic Universe, it is based on a Marvel comic and therefore it contains two traditional elements of all Marvel films. We talked a little bit about the post-credits sequence, and deliberately left out the other cool thing that was in it: a cameo by Stan Lee. Spoilers for Big Hero 6, out today, obviously. After the film’s titular six heroes are first attacked by a kabuki mask-wearing villain, they realize that they need to go into hiding. One member of the group, Fred (T.J. Miller) offers them a place to stay, and guides the group to his family’s estate. Fred is a loveable slacker who is not a college student, but still spends all of his free time hanging out at San Fransokyo Tech, where he moonlights as the school mascot and begs his scientist friends to build him science fiction toys. Needless to say, everyone is very surprised to see that Fred comes from money and the large fancy house with the posh butler stuns them all. As they walk down the hall, Fred points out a family portrait. 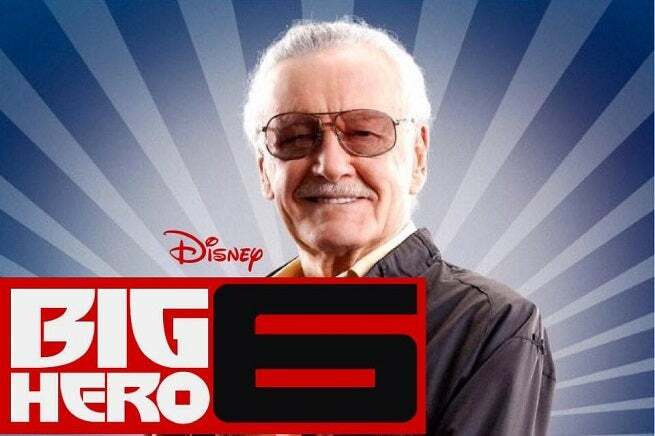 In the picture, his father is none other than Stan Lee, in animated form. We return to that portrait for the post credit scene. Fred is back in his family mansion, talking to his father’s image. Fred is clearly proud of his newfound role as a superhero, and wants to tell his father about it. Suddenly, he trips a secret door hidden in the portrait. Fred walks into a secret room, finding weapons, costumes, and tech which clearly demonstrate that he is not the only superhero in the family. His father appears behind him, holds up a pair of underwear which is clearly a part of his superhero costume, and repeats Fred’s earlier explanation of how to get four days of use out of one pair of underwear before washing. The two men hug, and his father say that they have a lot to talk about. And yes, Fred’s father is voiced by Stan Lee.